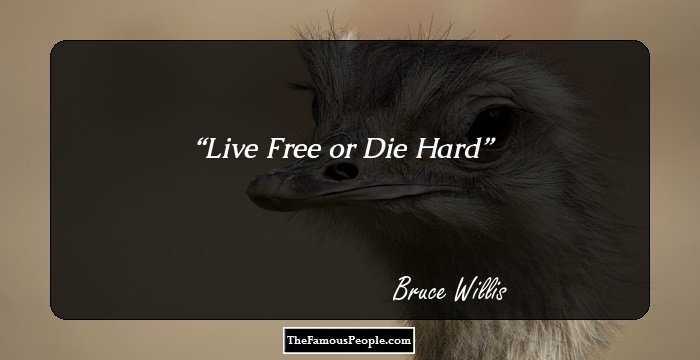 A collection of Charles Bronson quotes on fear, anger, frustration, violence, never, movies, etc. 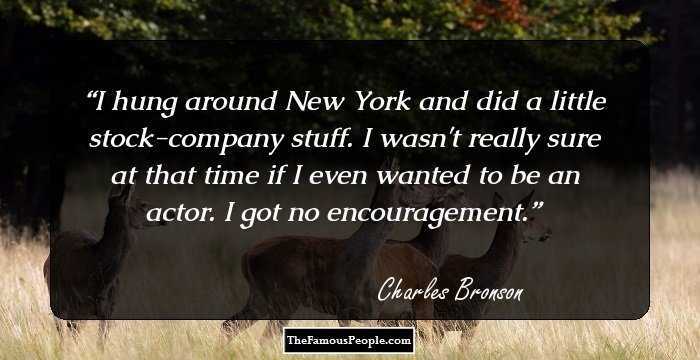 American actor Charles Bronson was best known for his macho roles as a police officer, gunfighter, and vigilante. Coming from a poor background, he worked in a coal mine till he entered the military service. Directors found him too masculine and not ideally suited for many roles. He was married three times and lived in a large house with his children. 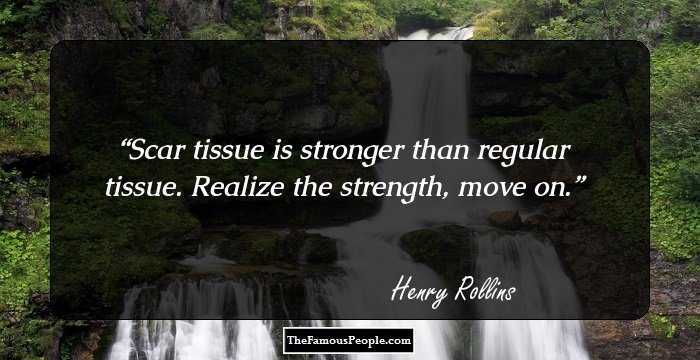 He shared the pain and anguish of his second wife who died of breast cancer. 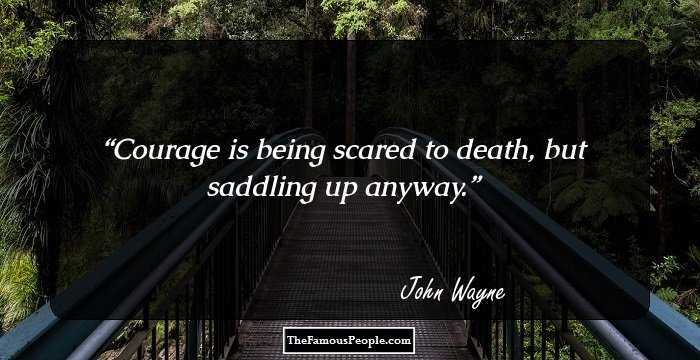 His own last days were ridden with illness and frustration when his body started giving up on him and he died at the age of 81. 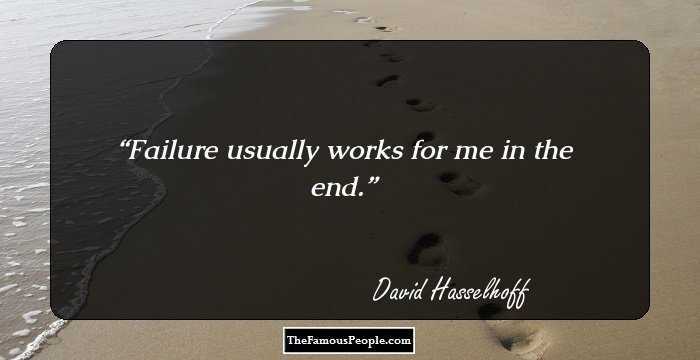 We have curated his quotes from his interviews, films, articles, etc. A collection of Charles Bronson quotes on fear, anger, frustration, violence, never, movies, etc. 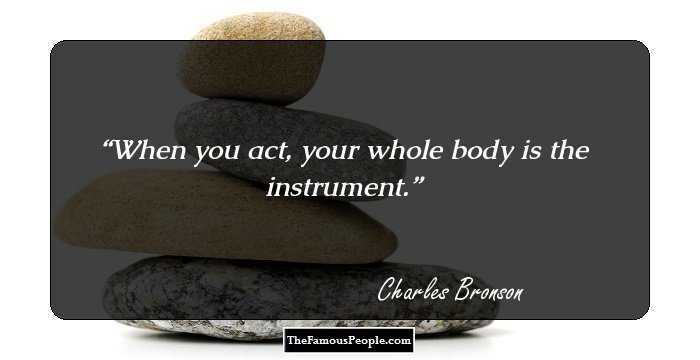 When you act, your whole body is the instrument. 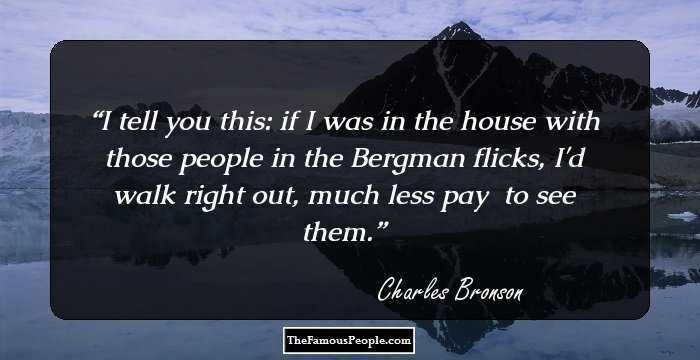 I tell you this: if I was in the house with those people in the Bergman flicks, I'd walk right out, much less pay $5 to see them. I am not a Caspar Milquetoast, but most of the time, I'm mild. 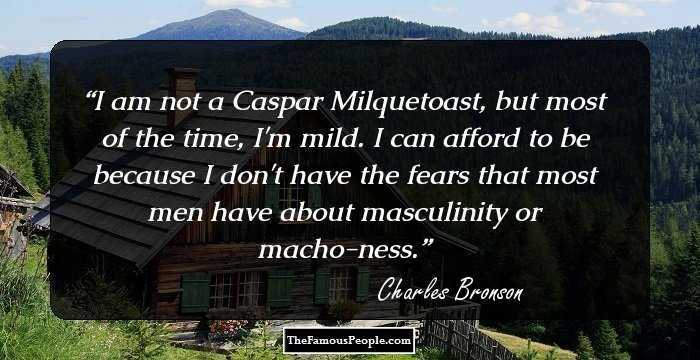 I can afford to be because I don't have the fears that most men have about masculinity or macho-ness. 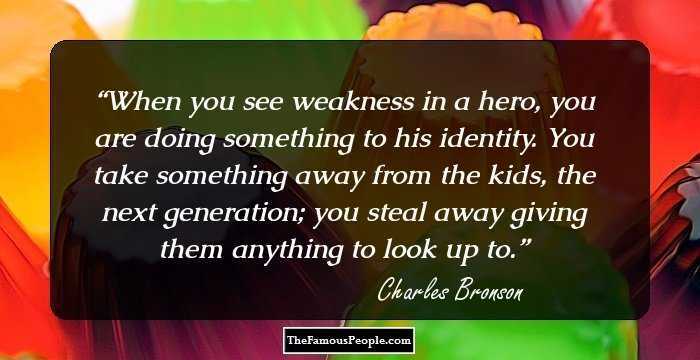 When you see weakness in a hero, you are doing something to his identity. You take something away from the kids, the next generation; you steal away giving them anything to look up to. I hung around New York and did a little stock-company stuff. I wasn't really sure at that time if I even wanted to be an actor. I got no encouragement. I'm entertained more by my own thoughts than by the thoughts of others. I don't mind answering questions. 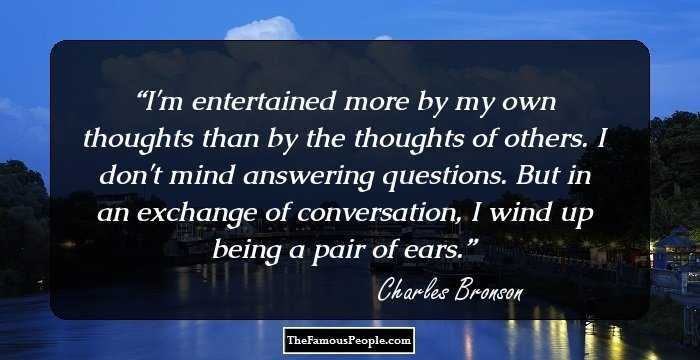 But in an exchange of conversation, I wind up being a pair of ears. I supply a presence. There are never any long dialogue scenes to establish a character. When I was a kid, I was always drawing things. I'd get butcher paper or grocery bags and draw on them. I'm only a product like a cake of soap, to be sold as well as possible. Don't ask me to explain a mystique. I'm just enjoying all this while it lasts. I'm basically doing the same thing I was doing 20 years ago. We don't make movies for critics, since they don't pay to see them anyhow. Times were poor. I wore hand-me-downs. And because the kids just older than me in the family were girls, sometimes I had to wear my sisters' hand-me-downs. The critics never see my role as it is - as a man protecting his garden killing poisonous snakes. 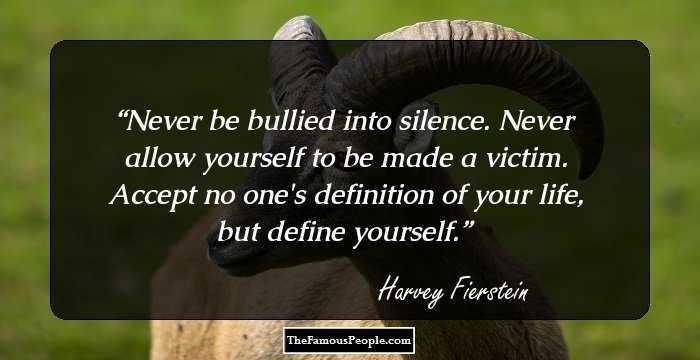 Instead, they say it's just me again committing violence. 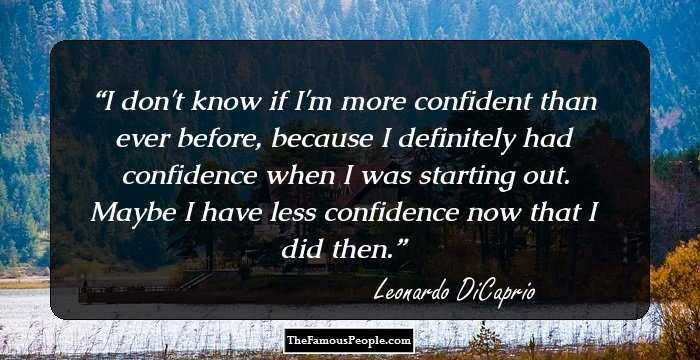 I can play the character better because of the roundness of my experience - because of the things I've been through. All those method guys - like that De Niro, Stallone, and what's his name, Pacino - they're all the same. In Ehrenfeld, we were all jammed together. All the fathers were foreign-born - Welsh, Irish, Polish, Sicilian. We were so jammed together, we picked up each other's accents. And we spoke some broken English. When I got into the service, people used to think I was from a foreign country.